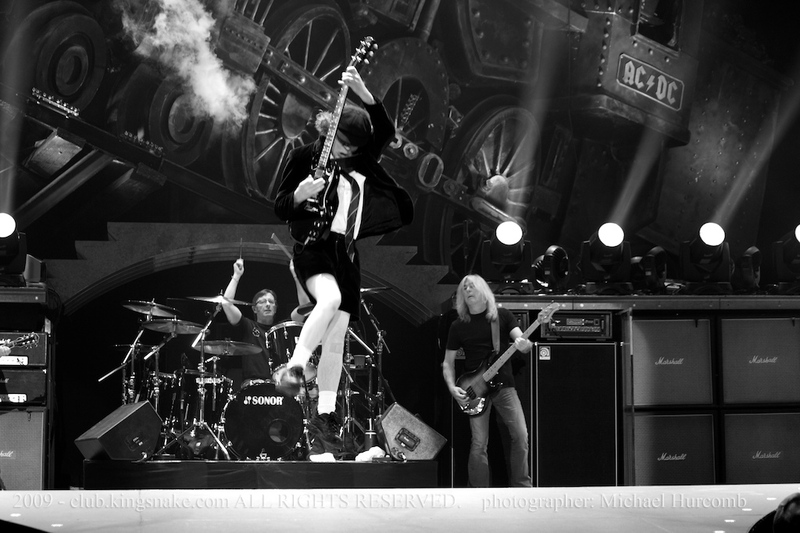 Photo Spread: AC/DC at The Rogers Centre, Toronto, Ont. AC/DC - January 9, 2009 Rogers Centre, Toronto, Ont. You know the show is going to be good when the first thing you see is 45,000 AC/DC fans wearing red light-up devil horns!!! A great show to shoot with the photographers placed at the start of the 4 foot high catwalk and bright stage lights that let you shoot at 400 ISO. The show started with a great intro that I won't reveal in case you attend a show on the tour - and you should! The band rocked out to the first single from Black Ice "Rock 'N ' Roll Train, followed by "Hell Ain't A Bad Place to Be" and "Back In Black". As the photographers were leaving they launched into another new song, "Big Jack". They don\'t show their age for a second, running around the stage and really looking like they're having a great time. Angus should be at an age where putting on the school boy outfit but he pulls it off and looks great. Brian still belts it out just as well as anyone and looks great for 61. A fantastic start to the 2009 Toronto concert season!